In the modern medical field, cataract surgery in infants has become a common intraocular procedure. The timing at which the child undergoes surgery and its direct relationship to the duration of visual deprivation has a vital role to play. Unilateral cataract operated within 6 weeks of birth results in better visual outcome. 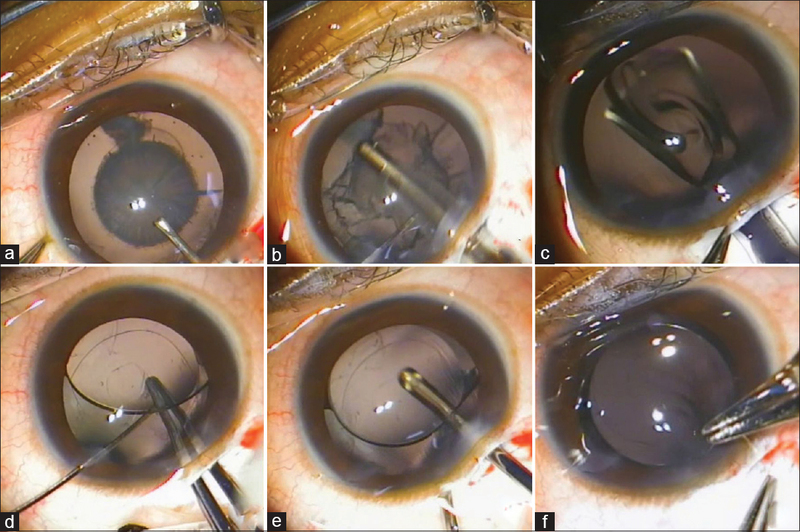 Bilateral cataract surgery should not be delayed beyond 10 weeks of age. The acceptable age at which intraocular lens (IOL) is planned for implantation is gradually decreasing. Calculation and selection of an IOL power are among the major challenges for successful long-term visual outcome in view of the axial growth and myopic shift in children. At present, the initial desired refractive outcome following IOL implantation is toward hypermetropia, with desirable residual refraction dependent on the child's age. Refractive results after primary IOL implantation in children <24 months are variable. Limited data exist about their long-term outcome. Hence, we report our experience with these children in this study. The study was aimed to analyze long-term outcome in children who underwent cataract surgery for congenital cataract with IOL implantation below 24 months of age. This was a descriptive, analytic, retrospective study of children <24 months of age who had undergone phacoaspiration, primary posterior capsulorhexis (PPC), anterior vitrectomy, and primary IOL implantation with a minimum of 4-year follow-up for congenital cataract [Figure 1]. These children were operated between January 2009 and December 2013. Children with structural anomalies such as microphthalmia, persistent hyperplastic primary vitreous, coloboma, traumatic cataracts, and inadequate follow-up were excluded from the study. All children underwent a complete ocular evaluation. An ultrasound-B scan was performed in cases with cataract obscuring the view of the fundus. All surgeries were performed by a single senior surgeon. Keratometry was performed using handheld auto keratometer, and axial length was calculated using ultrasound A-scan, after induction of general anesthesia without eyelid speculum. IOL power was calculated using SRK T formula. IOL power selection was based on the Dahan's criteria (20% undercorrection in infants). The operated eye received either three-piece polymethyl methacrylate (Aurolab B3602, Madurai, India) lens or foldable hydrophobic acrylic lens (Alcon Surgical, Fort Worth, Texas, USA). Intraoperative details and immediate and late postoperative complications were recorded. Postoperatively, visual acuity, retinoscopy, and spectacle spherical equivalence (SE) were recorded at 2 weeks, 1 month, and 6 months and the latest visit, respectively. Vision was recorded with Snellen's chart at the latest visit. Intraocular pressure was measured with pulse air noncontact tonometer if found high was rechecked using Goldman applanation tonometer. Written informed consent from patient's attender ( first degree) has been obtained at the time of surgery for utilizing the patient's details for study purpose. Approval of the study was obtained from the institutional ethics committee. All the data have been described in percentage and mean ± standard deviation. Student's t-test was performed. Test of significance was derived. P value were considered statistically significant if it was <0.05. If not, it was considered statistically nonsignificant. Thirty-nine eyes of thirty children were analyzed. 21 children (70%) were operated for unilateral cataract and nine children (30%) were operated for bilateral cataract. Of them, 53% were male and 47% were female. 18 eyes (46.15%) were operated at <12 months of age and 21 eyes (53.84%) were operated between 13 months and 24 months of age. Mean age at surgery was 13.6 months (range 6 weeks to 24 months) [Table 1]. Mean preoperative axial length was 21.14 mm (range 18.35 mm–24.8 mm) [Table 2]. 49% presented with total cataract, 46% with lamellar cataract, and 5% with posterior subcapsular cataract. The follow-up ranged from 48 months to 102 months (mean of 66.6 months). Mean IOL power was 23.5 D. Of the type of IOL, 90% eyes were implanted with foldable hydrophobic acrylic lens and 10% with PMMA lens. All the eyes received an IOL placed in the capsular bag. None of the children had intraoperative complications. Eight (21%) had posterior capsule opacification and underwent membranectomy and three (7.7%) children had IOL exchange due to large myopic shift. None had secondary glaucoma. Shift in mean SE was 4.43D at 2-week postoperative to (−1.02D) at the latest visit [Figure 2]. Mean myopic shift was 5.91D. 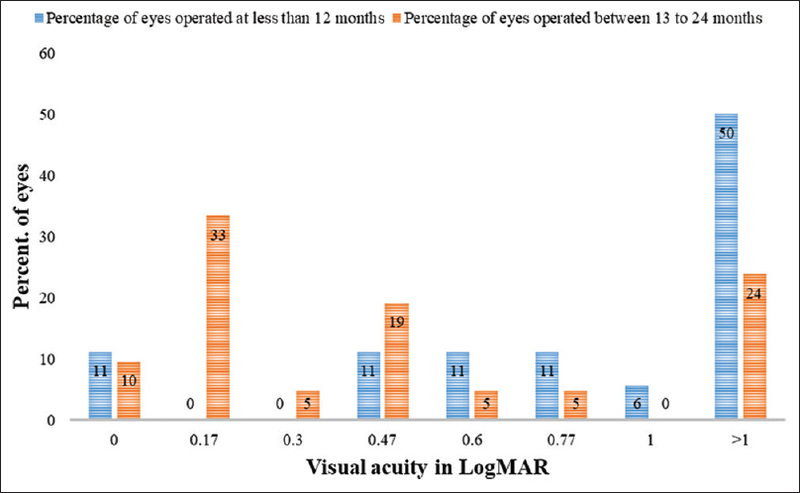 46.1% had final visual acuity better than logMAR 0.47 [Figure 3]. Mean final visual acuity was logMAR 0.77. 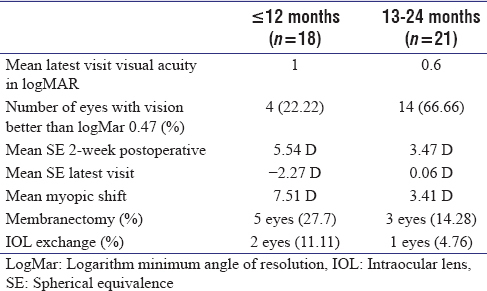 Comparison between children operated <12 months and 13–24 months of age for the myopic shift and visual acuity in the last visit had very high statistical significance (P = 0.0003) [Table 3] and [Figure 4]. 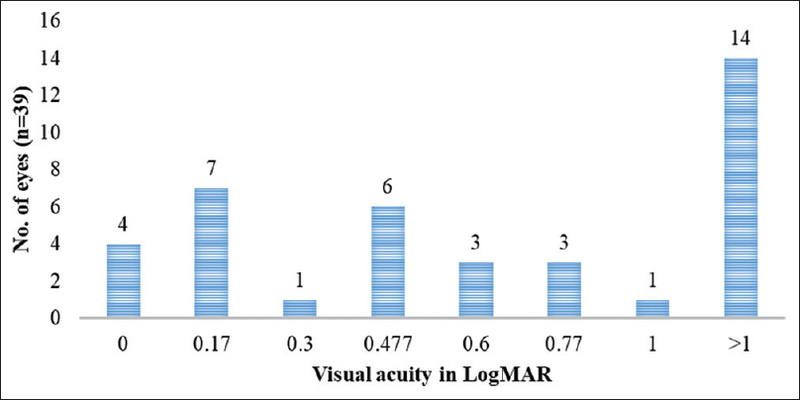 Mean visual acuity at the latest visit in unilateral cataracts was logMAR 1.07 and logMAR 0.3 in bilateral cataracts, when compared showed high statistical significance (P = 0.0001). About 77% in the bilateral cataract group achieved the final vision better than logMAR 0.47 [Table 4] and [Figure 5]. On comparing the outcomes between the cataract types, lamellar cataract (46%) and total cataract (49%), there is no statistical significant difference in SE at 2-week postoperative visit (P = 0.608), SE at last visit (P = 0.386), myopic shift (P = 0.551), and final visual acuity in logMAR (P = 0.126). Our study had 70% unilateral and 30% bilateral cataract while the study by Ram et al. reported 44% and 66%, respectively. Our study comprised 53% male and 47% female children while Gupta et al. had 49% and 51%, respectively. In his study, the mean age at surgery was 11.21 ± 5.90 months, while our study reports it as 13.6 months. We had 46.1% children operated within 12 months and 53.8% between 13 and 24 months of age, wherein the other study by Sukhija et al. was 63% and 27%, respectively. Studies which have reported safety profile of primary IOL implantation had a mean follow-up as short as 8.5 months  and as long as 102 months. Gouws et al. showed that 50% achieved logMAR 0.47 or better visual acuity  and Sukhija et al. had final best-corrected visual acuity logMAR 0.47 or more in 92% eyes, about 73% achieved logMAR 0.3 or better when both eyes were operated. Our study group had mean visual acuity of logMAR 0.77 and about logMAR 0.3 in the bilateral cataract group, results comparable to the above studies. Trivedi et al. reported the incidence of glaucoma to be 24.4% after IOL implantation. Wong et al. reported that 13.5% of infant eyes undergoing IOL implantation are likely to develop glaucoma. It has also been noted that incidence of glaucoma can be reduced by placing foldable IOL. In our study, majority (90%) of the children received foldable hydrophobic acrylic IOL and we had none of the cases developing secondary glaucoma [Table 5]. We had three children undergoing IOL exchange for reason of myopic shift at the age of 8 years. Children operated at early age can have much more myopic shift than older children. Our study showed children with high myopic shift in comparison to other Indian studies in the literature., [Table 6]. This is because their IOL power is fixed, while the lens power in the phakic eye changes so as to compensate for the axial growth. This trend of myopia in pseudophakic eye is the result of normal eye growth. Studies have shown that pseudophakic eyes tend to have more growth (axial elongation) during the first 2 years of life and continue to grow slowly up till the age of 8 years. Determination of the accurate IOL power for an infant's eye is a unique challenge. Children would emmetropize or tend to be slightly myopic by the time they would be schoolgoing. Crouch et al. showed a myopic shift of 5.96 in children <2 years of age with a mean follow-up of 5.4 years  similar to our study. For better refractive results, studies have shown a guide for selecting IOL power in pediatric cataracts, using current formulas with the understanding that new formulas will need to be devised for better prediction of IOL power. With the improvement in surgical techniques, newer generation IOL's and presently available modern surgical equipment, cataract surgery in young eyes has become much safe. It results in visual rehabilitation in children with IOL implantation at a much younger age. Our study shows a favorable long-term outcome of primary IOL implantation in children who were operated before 2 years of age. The importance lies in choosing an appropriate IOL power in this age group in view of the myopic shift. I extend my gratitude to my institution for giving me the opportunity to carry out the study. My sincere thanks to my colleagues for their timely support. I thank my statistician and supporting staff who helped me in the data collection, entry, and analysis. Lloyd IC, Ashworth J, Biswas S, Abadi RV. Advances in the management of congenital and infantile cataract. Eye (Lond) 2007;21:1301-9. Ram J, Brar GS, Kaushik S, Sukhija J, Bandyopadhyay S, Gupta A, et al. Primary intraocular lens implantation in the first two years of life: Safety profile and visual results. Indian J Ophthalmol 2007;55:185-9. Sukhija J, Ram J, Gupta N, Sawhney A, Kaur S. Long-term results after primary intraocular lens implantation in children operated less than 2 years of age for congenital cataract. Indian J Ophthalmol 2014;62:1132-5. Gupta A, Kekunnaya R, Ramappa M, Vaddavalli PK. 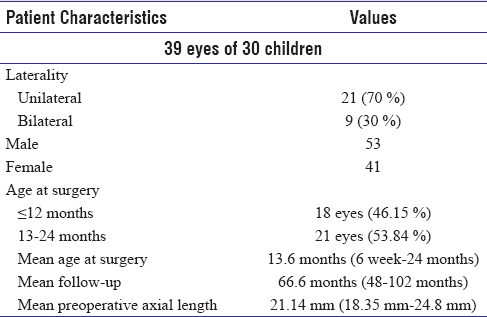 Safety profile of primary intraocular lens implantation in children below 2 years of age. Br J Ophthalmol 2011;95:477-80. Gouws P, Hussin HM, Markham RH. Long term results of primary posterior chamber intraocular lens implantation for congenital cataract in the first year of life. Br J Ophthalmol 2006;90:975-8. Vasavada AR, Trivedi RH, Nath VC. Visual axis opacification after AcrySof intraocular lens implantation in children. J Cataract Refract Surg 2004;30:1073-81. Trivedi RH, Wilson ME Jr., Golub RL. Incidence and risk factors for glaucoma after pediatric cataract surgery with and without intraocular lens implantation. J AAPOS 2006;10:117-23. Wong IB, Sukthankar VD, Cortina-Borja M, Nischal KK. Incidence of early-onset glaucoma after infant cataract extraction with and without intraocular lens implantation. Br J Ophthalmol 2009;93:1200-3. Althomali T, Awad AH. Myopic shift in pediatric pseudophakia: Long-term follow-up. Saudi J Health Sci 2012;1:85-8. Crouch ER, Crouch ER Jr., Pressman SH. Prospective analysis of pediatric pseudophakia: Myopic shift and postoperative outcomes. J AAPOS 2002;6:277-82.